Subaru has announced a new WRX STI Spec C version will be offered on the four-door model for the Japan market. 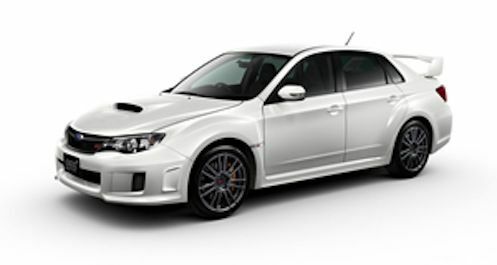 Subaru has announced that the 2013 WRX STI will add the competition version Spec C to the four door variant. The "A-Line type S Package" was also introduced in both the 4-door and 5-door models. But before you get too excited, the new lighter, more powerful Subaru WRX STI models will only be available in Japan. If you feel like the red-headed step child, you are not alone. The new variants would certainly be a hit here in the U.S. The Subaru WRX STI has been a big success here in North America and has a loyal following. The Japan versions arrived in Japanese showrooms earlier this week. But for now, all we can do is wait. The new four-door Spec C will also be getting some other fun upgrades. WRX STI models will feature new items such as the newly designed 18-inch aluminum wheels. And Recaro performance seats are offered as an option. The "A-Line type S Package", a special edition introduced last year, was also introduced in both four-door and five-door models. The "A-Line" also uses a 2.5 liter Horizontally-Opposed Boxer turbo engine and 5-speed automatic transmission. The Spec C was first introduced in Japan as a 5-door model in December 2010. The four-door introduced this week will enjoy the same high-performance engine as the five-door model. And it goes beyond just more power under the hood. Subaru also increased performance by reducing weight and tweaking the suspension. The Spec C body is lightened by small but significant changes with an aluminum hood, lighter window glass and a smaller battery. Upgrades over the standard WRX STI are substantial. Subaru first of all made adjustments to the ECU and then fitted a special ball-bearing-type twin-scroll turbocharger for added torque and quicker acceleration. Horsepower remains the same at 304 as the standard STI, but torque was increased from 311 on the turbocharged, 2.0-liter horizontally opposed four-cylinder engine to 317 lb. ft. on the Spec C. A six-speed manual gearbox is mated to the high-performance boxer engine. The Spec C also gets a rear limited-slip differential that is mechanical rather than a Torsen-type. The suspension wasn’t left alone and is unique to the Spec C. Subaru engineers reinforced the front crossmember, and the steering is improved by increasing fluid volume through the power steering pump. The new 18-inch wheels will be wrapped in Bridgestone Potenza RE070 summer rubber for extra traction. In order to stop the super-quick Spec C, Brembo brakes are used that sport Gold-colored calipers peaking through the newly designed aluminum wheels. For now, all we can do it read and weep that the 2013 Subaru WRX STI Spec C is for Japan only. We can only hope that the folks over at Fuji Heavy Industries Ltd. (FHI), the manufacturer of Subaru automobiles, will hear our cries.